A special screening of independent documentary feature Mother (어머니) was held at Indieplus in Gangnam, on the 29th of January. Director Tae Jun-seek (태준식) was also in attendance, and very kindly answered the questions posed by the audience following the screening. 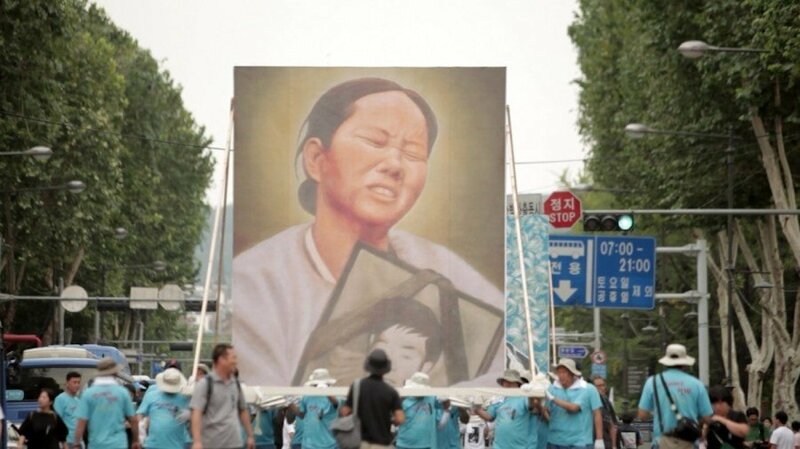 Mother (어머니) is a documentary that follows the final two years in the life of activist Lee So-seon (이소선), a powerful figure in the battle for human rights for workers. Her late-son, Jeon Tae-il (전태일), is a legendary figure throughout Korea and other Asian nations for his dedication to improving rights for laborers. His protests against the abuses and of the dictatorship of Park Chung-hee (박정희) during the ’70s actually had the opposite effect as the government brought further exploitation, and as a result the then 22 year old set himself on fire. Jeon Tae-il’s death galvanized the workers’ rights movement, and since then Lee So-seon has tirelessly campaigned in his memory. 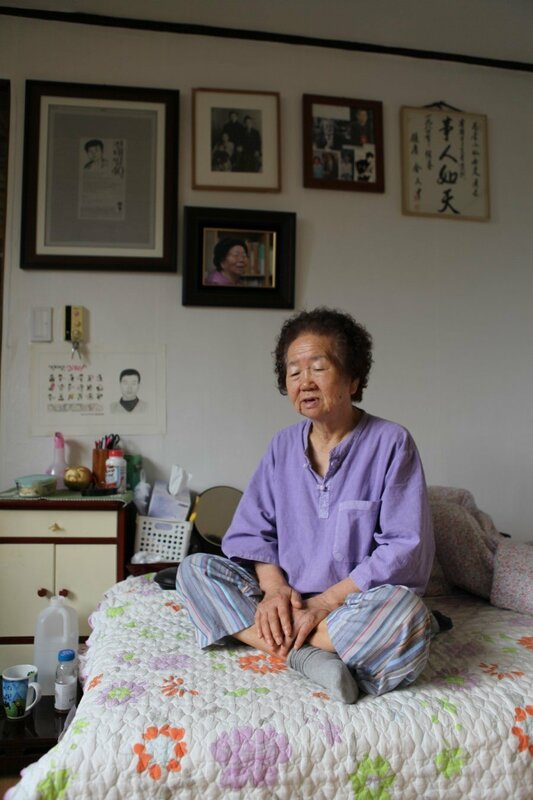 Rather than focus on her efforts however, director Tae Jun-seek explores Lee So-seon’s final moments on Earth and her indomitable will in the face of ailing health. Following the screening, the Q&A was translated by independent film producer Hwang Hye-rim (황혜림). Producer Hwang began by asking about the background of the film, and how director Tae began the project. Director Tae Jun-seek: Well first, as producer Hwang explained, Jeon Tae-il is really one of the most important figures in modern South Korean history to the extent that he’s almost like a myth. And he’s a very important figure not just in Korean history, but also he was an inspiration to other countries in north-east Asia. He’s like a figure that symbolizes struggles for democracy in these areas. That’s one of the reasons you can see the director of the play (within Mother) is from Taiwan. That’s part of the reason why he was willing to do a play about him. I think the reason it was possible, the whole journey that Jeon Tae-il had, was because of his mother and even after his death Lee So-seon was very faithful to what her son believed and she tried very hard to keep those principles throughout her life. And that made me curious about her. What could make her strong like that? What could make a person like her? That was the start of the journey of this film. In this film you can see just a part of her life, but I thought it would be meaningful to show that part of her life, to understand Jeon Tae-il and also to understand Korean democracy. So I met her in 2009. I visited her, and told her I wanted to make a film of her. That was the start of the film. Producer Hwang Hye-rim: I should also give you a little bit of information about director Tae. He started his film making as an activist and a documentary film maker in Labor News Production, which was one of two of the earliest film documentary companies in Korea. The other was Documentary Pureun Audio/Video Collective. These are the two companies that started making productions back in the ’80s, on the scene of the struggle. So he started as one of the members of Labor News Production and produced a lot of documentaries and newsreels, and feature documentaries as well, which included mostly the scenes of struggles, and depictions of real life. Question: Because Jeon Tae-il is already very iconic figure, and his mother is also a big figure, it must have been quite a challenge to start a story and make a story out of it. What kind of concerns do you have when you started? Director Tae: Well it’s been a while since this film was released, it was released last year (2012) in Spring. I kind of thought afterwards, “Gosh I really chose a really really big figure for my film.” It was probably almost impossible to tell her story in a feature documentary. And also I had pressure from time as she was dying at the time and she passed away during filming. So I was running out of time, and I had this pressure of having to finish as soon as possible. So that was the limit I had, from nature. But the idea arose from the first meeting I had with her. I knew about this person from documents, I read a lot about her, I thought I knew about her, but from the first meeting she kind of gave me this inspiration on how I should tell her story. Because she was even back then, in her last days, still very funny, very interesting, and a very strong person. And I thought maybe it would be ok to tell her story from the present, to start the story from now, and not giving too much information ahead, but telling the story from her present and make a story out of it. I thought she was a beautiful person and strong enough to be in the film as she was. That was part of the intention, to make the story like this. Also I thought that I definitely need a long time to film her, and after a while I thought it would be effective to have a structure to go back to the past [and show her history] from the present. Question: Were you able to distinguish any of the main influences on her life? Her parents were no doubt dead already, but what did you think were the really important factors that made her the strong personality type that she was? Director Tae: I think that there were a lot of influences that made her who she was. She spent her childhood in Korea when it was a Japanese colony, and it was a really hard time. 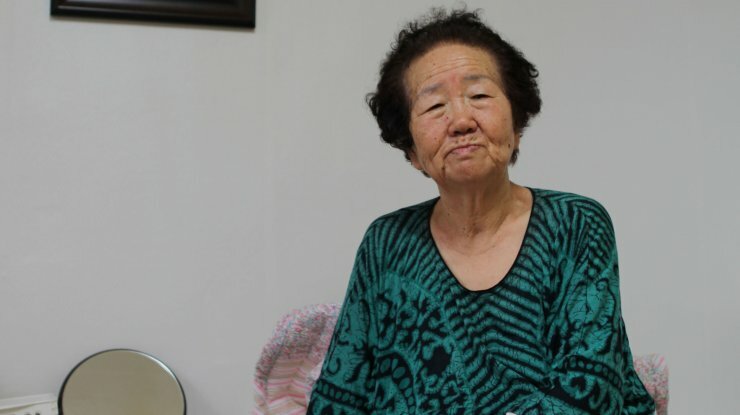 She couldn’t live with her parents when she was young, and she also had the experience that she was almost dragged away to be one of the ‘comfort women’ for the Japanese army. But luckily she escaped and she had to live in the mountains for about a month by herself. It was a time of hardship for all Koreans, so she had to live all the tragedy of modern Korean history by herself. So I think that’s part of the reason that made her as strong as she was. There was also the big influence from religion. She was a Christian and she always believed from a very young age about love for humanity, and to love and take care of your neighbours, and she also taught that to her son Jeon Tae-il. There were part of her principles from a very young age even after she lost her son in that tragic event. That was part of the influence that made her strong, I think. It’s not just about religion, but also her basic nature, to take care of her neighbours, people who share the world with her, people who suffer more than her, and she wanted to take care of these people. And she taught her son like that too. Also you can see in the film, when she was telling the story of her childhood she was saying [to bullies] “Beat me if you can.” She was that brave, and always against unreasonable power, and she always stood for justice. She did resist as much as she could, and they all influenced her into being strong. Question: Can you tell us a bit about your history? You said you worked for one of the first documentary companies. How was your work used? Was it used to help the democracy movement, or did the government try and use it to strengthen their position? How did your history influence this documentary? Director Tae: At that time I started working at Labor News Production I didn’t really think – not just me, but all of us – we didn’t really think we were documentary film makers. We started it as a labor movement, that we were taking part in the movement at the time. So we thought of ourselves as activists. So that was the start. I thought of myself as an activist taking part in the movement for 6 years, and I worked there as a documentary maker for that time. That’s quite different from thinking of yourself just as a documentary film maker. It was always about the real scenes of struggle, and I learned about making a documentary and the reasons why we need this fight for certain issues. And I also go to know Lee So-seon. So all these experiences led me to this film, I think, after all these years. Also I learned several techniques to actually be able to make a film, which became sometimes a survival technique. Making films is a difficult job sometimes. All those years at the Labor News Production became the influence for this film. Question: I really enjoyed the film. What is the importance of this film, and these types of films and history, for young people in Korea? And are they aware of these things in public schools, or just in history books? Director Tae: I don’t think we have any public education or records for students in elementary, middle and high school, or even in university that teaches about Lee So-seon. But there are several books in the public education process that tell about her son, Jeon Tae-il. He is known to a certain extent, and there are also documentaries about him, and also a fiction film about him. So I’d say her son is well-known, but the mother not as much. There have been many efforts made to let Jeon Tae-il and his work more widely known to the public, but I think it’s never enough. There are still many ongoing efforts. The reason that this is important is that there are still many struggles over human rights, especially for workers, laborers. Lee So-seon was a person who spoke throughout her life about human rights and solidarity and the struggles we have to go through to achieve it. That’s why I thought her story was inspiring. There is still not enough consideration about the human rights of workers. It’s not really reflected in the process of public education. I think we need more records and films that can tell the younger generation about the importance of human rights. That’s why more and more films are coming out of the independent film scene which deal with these kinds of issues. It’s still never enough, and we are living in a country where a dictator’s daughter is president, so as you can guess it’s more difficult and more tricky to make these kinds of films now, but there are still efforts by independent film makers. Question: I was really touched by the film, I thought it was better than other dramas and soap operas. I thought from the poster it was a film about an old woman, but I realised it was about the ‘Mother of Workers’ and it was really interesting. You put a lot of focus on her ordinary life and behaviour. I’d like to know why you choose those kind of tactics to portray her. Director Tae: Well I think in Korea, people think of the labor movement as too serious sometimes and too violent. A lot of people think of the labor movement with those kinds of stereotypes. I think that’s the basic background I had when I started this film. As you can see in the film, the director of the play from Taiwan, he says, “It’s always about big action, or red ribbons and violent actions and demonstrations.” So people connect the image of throwing stones and Molotov cocktails at police when they think of the labor movement. They think of the images first, and it’s the big preconception about the labor movement here in Korea. Why it’s like that is another question. But Lee So-seon also thought it would be better if we can change that preconception and those images of the labor movement with this film, and I was trying to say that I don’t think these people are more violent or more organised or skillful in fighting. They are not those kinds of people. Fighting for your human rights is your basic right, that’s why they are fighting. It’s not because they are specifically violent people, that’s part of the report I wanted to make. Rights to work and for survival are your basic human rights. That should be natural. Lee So-seon was a person that symbolised that kind of idea. As long as you are human, you need to fight for your rights when they are threatened. I thought because she’s a person like that, I thought it’d be more effective to show her charm in everyday life, to show trivial things, to reveal her strong message. I tried to use those things to approach those ideas in her life, and to show you that. I also tried to depict the events backwards in the timeline, from the small to the big ideas, that’s why I didn’t want to put specific focus on the promise [to her dying son], or talk too much about it. I didn’t want too much melodrama out of it. I tried to leave Jeon Tae-il out of it as much as possible, although it’s impossible to leave him totally out of the film. I tried to show her as ordinary as possible, just as we are and her that her fight is not something too noble or too difficult, but a fight that has to be done for human beings. I wanted to show her life. Question: You mentioned Park Geun-hye earlier. Now that she’s in power, do you think making these kinds of documentaries will become more difficult? She quite famous for being sensitive about anything bad said about her or her father, so how will you go about making future documentaries? Will you change anything? Director Tae: Well I don’t think I will change anything under the regime of Park Geun-hye, as we already survived the Lee Myung-bak era. It will be difficult, but we already know about the difficulties so I don’t think I’ll change anything. At least, when it’s concerned about making films. I hope and believe that as we’ve achieved a democracy it wouldn’t go back as far as the old days when we had a fascistic dictatorship. Of course I can guess that there will be certain kinds of pressures on people who are making these kinds of films, and who are not afraid of getting their voices heard. So there will be that kind of suppression. But I don’t think people who are making those kinds of films are too afraid, whatever may come. The more difficult thing is everyday survival. We have achieved a democracy in terms of politics, but not as much in cultural aspects. There is still less and less support for public art, like making documentaries or independent films, so I think there is not enough support for independent artists these days. I think I’ll spend these 5 years under Park Geun-hye to try and make things better for independent artists. Thank you to director Tae Jun-seek for generously answering the questions, and to producer Hwang Hye-rim and manager Kwon Mi-hui for translating and hosting the event.